At a downtown groundbreaking event, late Thursday, construction officially started on phase one of Miami Worldcenter -- America's second-largest mixed-use urban development -- the biggest building project in Florida and Miami history. Miami-Dade Mayor Carlos Gimenez, Commissioners and Miami Worldcenter Developers Daniel Kodsi, Nitin Motwani and Art Falcone Break Ground on America's Second-Largest Urban Development Featuring 700-foot, 60-story, $500 Million Dollar Signature Luxury Residential Skyscraper, Paramount Miami Worldcenter. Miami Worldcenter will be the city's new multi-billion dollar, mega-retail, residential, entertainment and transportation complex. It will be built on a 1.1 million square foot terrestrial landscape; spread across six downtown Miami city blocks. 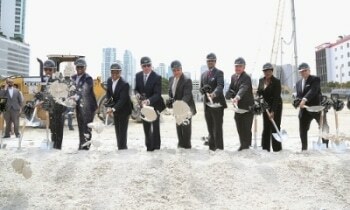 The first phase of construction begins with Paramount Miami Worldcenter. It is the development's soaring signature residential skyscraper, which is 700-feet tall, 60-stories and costs $500-million. With shovels in hand, Miami-Dade Mayor Carlos Gimenez and master developers Daniel Kodsi, Nitin Motwani and Art Falcone and exclusive broker Peggy Fucci, dug into a mound of Florida soil signaling the start of construction. At 27-acres, Miami Worldcenter is second in size only to New York's Hudson Yards development at 28-acres. In comparison, Rockefeller Center, built in 1931, is 22-acres. Paramount Miami Worldcenter is the most heavily-amenitized and amongst the tallest luxury residential towers in the U.S. It boasts the world's largest private amenities deck, which includes resort-style pools, walking paths, gardens, bungalows, tennis courts and even an outdoor soccer field. Paramount Miami Worldcenter residents will ride in private elevators to the ground floor, which leads to an expansive restaurant and retail promenade. It will consist of an unprecedented collection of two and three level "High Street" style stores and a fusion of restaurants. It leads to a sprawling public plaza accented by fountains. Miami Worldcenter will intertwine six other downtown Miami residential and office buildings; a 1,800 room Marriott Marquis and Convention Center and several other hotels. Miami Worldcenter also serves as the intermodal hub for the downtown MetroMover and Metrorail elevated transit systems. Adjacent to Miami Worldcenter will be the main terminal of the All Aboard Florida intrastate high-speed railroad. It will connect Miami, Fort Lauderdale, West Palm Beach, The Space Coast and Orlando. Miami is in the midst of a surge in skyscraper construction. Currently, 22 towers are under-construction in downtown Miami, including Paramount Miami Worldcenter. The surge is being fueled by U.S. institutional investment and the flow of foreign capital pouring into Miami, according to the Miami Downtown Development Authority. Miami is the seventh busiest global investment destination, according to Coldwell Banker Richard Ellis, Inc. It is the world's largest commercial real estate investment firm. "Downtown Miami real estate historically increases in value from four to 10 percent annually, and, in recent years, we have seen values climb-up into the teens," emphasizes Kodsi, Paramount's CEO and developer of 24 mixed-use projects. "Miami real estate is one of the most valuable in the world, yet is less expensive, per square foot, than London, Paris, New York and other global cities," explains Motwani. "Yet downtown Miami valuations are, in many cases, equal to or greater than these cities." Fucci, CEO of OneWorld Properties, adds. "Paramount Miami Worldcenter is attracting buyers from the U.S., Canada and 28 other countries, especially from South America and the new wealth classes of China, India, Russia and Turkey." These people are wary of the stability of their own country's currencies, which are plunging against the U.S. dollar, according to Kodsi. "They are buying Florida real estate because it is one of the hottest and most-stable investments in the world." Miami-Dade Mayor Gimenez says, "We are building a city-within-the-city-of-Miami, which many forecast will be America's City of the Future." The mayor stresses, "Miami Worldcenter will create thousands of new construction jobs, generate billions of dollars in taxes and revenues, and provide a futuristic infrastructure for generations of Miamians." The 60th floor is Paramount's Rooftop Skydeck and Lounge. It is sculpted in the shape of the stern of a super yacht. It is a plunge pool oasis overlooking Miami. Of Paramount's 500 residences, 24 will be penthouses. Prices range from $700,000 to $4-million. Included are private elevators, outdoor living room-style terraces and 10-foot ceilings. More than 45 percent of Paramount Miami Worldcenter units have been sold at pre-construction prices, according to Fucci, one of Florida's most successful real estate brokers specializing in overseas buyers. Miami Worldcenter's completion date is set for 2018.